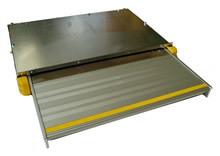 We have been manufacturing the B series cassette steps for well over 15 years. These highly reliable 600mm wide basic steps have been fitted to thousands of vehicles over this period. Like the S Series, the B series manual version incorporates the Stayco patented deploy lock-out and over-centre catch system. The Electric version is powered by the Stayco geared electric motor. These steps are priced at an extremely economic level and offer a low cost robust basic step for minibuses and large vans. They come in only a 600mm width. Fitting kits for suitable vehicles are available. The B Series steps come with a full 1 year warranty.